Entertainment in Your Purse | Breezy Mama Breezy Mama - Expert parenting advice, celebrity interviews, product reviews for kids, moms and babies and more! You know the scene–you’re waiting for an interminably long time in the (insert place here–doctor’s office, restaurant, pharmacy) and you know that any second now, the kids are going to absolutely lose it. That’s when you reach into your purse for one of these essentials–helps to stave off the meltdown for at least ten minutes more. Relaxation in a tin–that’s how I like to think of Bloom Putty. Created to relieve stress and fight boredom (amongst other things) the putty can work for anyone in the family. It is flexible but not slimy, so you can squeeze it, twist it, stretch it, break it and even bounce it! The putty also comes in 20 different varieties, 14 of which are scented and 6 are not. What more could you want out of a tin? 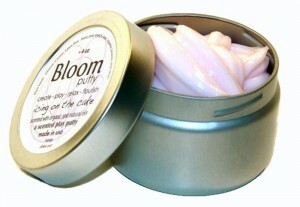 Bloom Putty, 7.95 for 28 grams. Click here to start shopping. Breezy Exclusive! Mention breezymama as you check out and receive 10% off your entire Bloom Putty order. Offer lasts until April 15, 2010. Breezy Mama Vanessa introduced me to these little coloring books. The size is what makes them so great–at only 6.25″ by 6.5″ they easily fit into your bag. The big line drawings make it easy for the toddler to color in as well. Just don’t forget to pack your crayons. Kiddie Color by Buki, $1.95. Click here to see Amazon’s selection. This marvelous invention–a piece of paper with some stick ‘um on the back–never ceases to amaze me. In this case, a fantastic diaper bag essential–the baby loves to peel them off the stack, one by one, and the preschooler uses them to draw on. How easy is that? 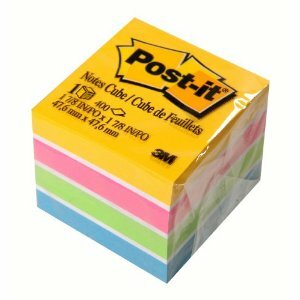 Post-it Notes Cube, $3.49. Click here to order from Amazon. The Doodle Pro, like the aforementioned, is great for all ages. My daughter can’t get enough of the erasing feature–scribble, erase, start over. And over, and over. My son likes to draw on it too, and it’s always great for a pick-up game of tic-tac-toe. 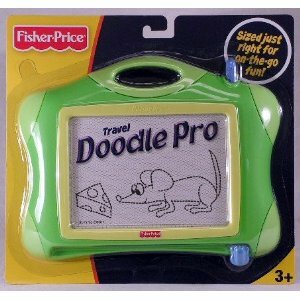 Fisher-Price Travel Doodle Pro, $11.95. Click here to order from Amazon. My husband is responsible for discovering this little secret. The drawings on the pages of this notepad are black and white, but when you start rubbing it, color magically appears. A wooden, pencil like tool, is enclosed, but you can use anything–paperclip, coins, etc. Again, the size is what makes it key–small enough to tuck in your purse. 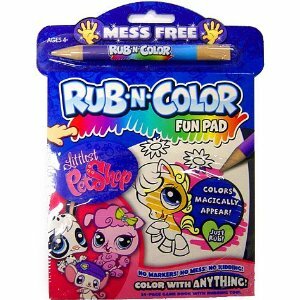 Rub-N-Color Fun Pad, $3.15. Click here to order from Amazon. So, you think you have to have a ginormous purse or diaper bag to fit all of the above? No need. I have all of this, plus crayons, matchbox cars, and little pocket size games in just ONE pocket of my Vera Bradley purse. The best purse that acts like a diaper bag, hands down. It was given to me as a hand-me-down, and it’s the greatest bag that I’ve used during my Mommyhood. The “Betsy” purse looks to be most similar to mine. 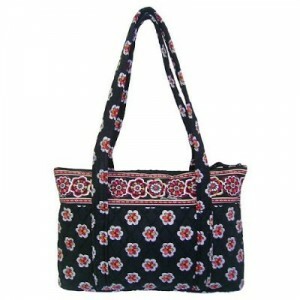 Vera Bradley Betsy Purse, prices vary. Click here to see Amazon’s selection.